Try as I might, I can't stop thinking about this nursery finally coming together. I mean, I have definitely been nesting these past few months but now that the room is painted, I want nothing more than to start getting things in place. The walls are the same delicious soothing light gray as our family room (the name of the color escapes me now, but it's Ben Moore) and we've repurposed the old family room rug for this room. We'll probably also be repurposing the "Jimenez dresser" as it is affectionately named from the dining room to use as a dresser/changing table. I randomly snagged a giant stuffed giraffe (a la this guy) at a garage sale last summer (totally not even pregnant at the time -- holy psycho) for $5 so that will make its way in there as well. And the crib that I used as a baby will be code compliant once Eric makes a few adjustments, so Baby Reed will use the same crib that my brother and I did! I know. So fun, right? I'm learning that gender neutral is not that hard when it comes to decorating the room. Clothes, however, are a whole different story. ok im dying to see a mood board of how the whole room is coming together - do you have a plan or is it top secret? i know you;ll do great things in there. i wanna see what youre thinkin!! So glad you are using that ottoman. I desperately wanted it for my girls' room but the colors didn't work. I love it! This is going to be one fab room! And gender neutral baby clothes...near impossible. I remember searching for that stuff. 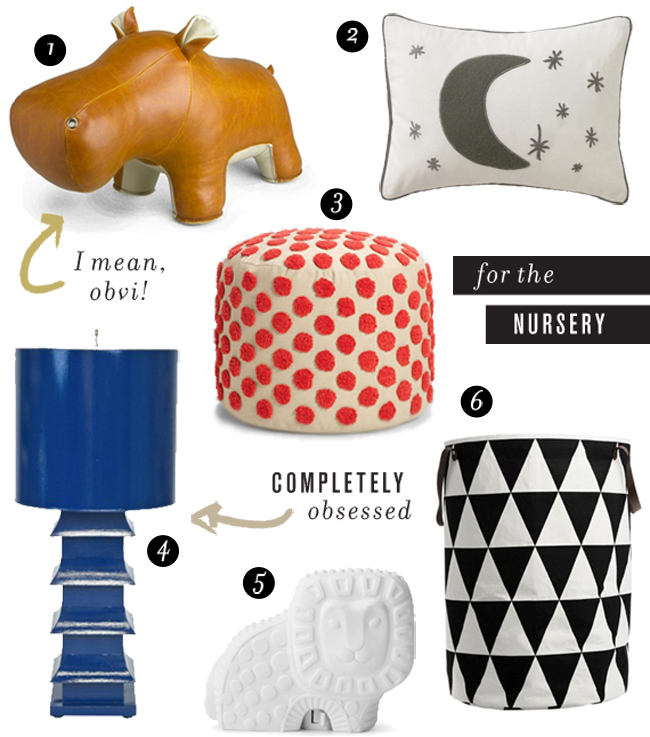 I'm loving that blue pagoda lamp! Yeay!!! Its so exciting! I love what you have so far! And that lamp is fabulous! I agree. I love your board and I love the cute graphics....I kinda want that hippo for myself. This is going to be the best nursery! I can't wait to see it all come together. BTW that hamper is adorbs. Haha agree! not so much neutral out there for clothes but a lot for decor, love ALL your picks!